Hot in My Backyard: Ali Keshvari says he just closed his eyes and "imagined the place where I wanted to be." It's 7pm on a sunny Wednesday in August and Ali Keshvari has been working for nine hours in his backyard, which he is converting into an outdoor palace. Or at least that's what his friends believe the space, which used to resemble a junkyard, will look like when Keshvari is done. Already, he has worked long days and nights to open up his yard, which is shadowed by the octopuslike branches of a giant bay tree, into a light-grabbing space replete with a dance floor, mirrors and a 14-foot waterfall. He has dug out a trench for what will one day become a pond featuring three giant stepping stones and two foot bridges--one built specifically for cats. He has sculpted a lifesize statue of the Buddha, which sits gold-faced and cross-legged beneath the tree's silvery trunk, its body draped with a saffron sash. More plaster heads sprinkle the area. One is balanced on the dance floor, awaiting the completion of the rest of its body. 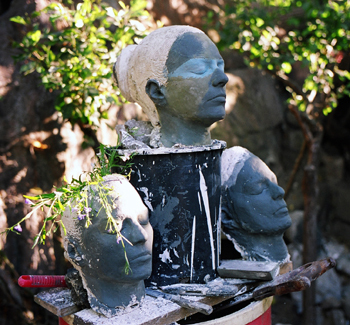 Three others heads are perched on the bottom half of an enormous bottle of Coca Cola, a tad ironic since Keshvari doesn't drink soda, but it does make an excellent stand on the sunny side of the yard for sculpture chiseling. "I never knew I had this capacity, because this is not what I was trained to do," says Keshvari, who grew up in Iran, studied to be a dental technician in Germany, then moved to California in 1994. "I did art as a way to get relief from stress and time and space, as a gateway to another existence--the here and now. Once I'm totally absorbed in a project, I don't feel the rain, the temperature, the weather. I only notice when it gets so dark that I have to 'wake up' and go back inside." "Inside" in Keshvari's case is a house that he bought eight years ago, at which point it was an average vacation bungalow, albeit one with an above-average number of pigeons milling around the yard. Since then, Keshvari has converted it into what can best be described as a temple, thanks to an abundance of classical arches and columns, not to mention full-length mirrors in every room. 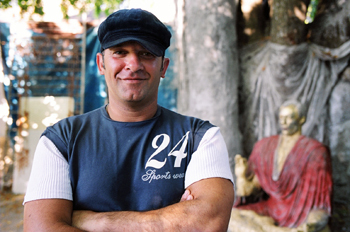 "Mirrors to me are a symbol of selflessness," says Keshvari who describes himself as being devoted to the path of Sufism. "Because of our ego, we reflect everything. We say, 'I am this. I am that. I like this. I don't like that." If you ask a mirror, 'Who are you?' it says nothing, but if you stand in front of it, it can reflect everything and anything. ... So, mirrors represent selflessness." Asked where his vision for the house and yard came from, Keshvari waxes poetic. "My intention is to leave my footprint that will transport whoever comes here, like a spark in a cold desert night. I want to present an environment, where there's no need to say anything, you just feel. It's like remembering something you know very well." Recalling how he rented a tiny studio on Pacific Avenue when he first came to Santa Cruz, Keshvari says he even managed to convert that small space "to remind you of home." "I believe that home is a holy place," Keshvari explains. "In many countries, home is just a place to crash, four walls, a shelter. But for me, home should be a place where you collect energy and create peace, so you can generate it the next day. So, it's very important how you build it. And it's very important to live in a home, not a house which has no soul." Headstand: Keshvari's sculptures listen attentively to his latest plans. At the start of his current backyard project, Keshvari spent hours sitting on a white plastic chair, meditating on a pile of recyclable material, which was scattered beneath the tree, but which he envisioned himself transforming into something inspirational and functional. "I close my eyes and imagine the place where I want to be, the sound I want to hear, even the temperature I want to feel on my skin. I let my imagination go with my senses. This is my jump-start," says Keshvari of his artistic process, which then involves finding technical ways to manifest his vision, using websites and books. "After that, I take a very deep breath and say, 'Let's do it!' Then nothing can stop me. I put my heart into it, I'm very spontaneous, I don't limit my vision and of course my ego is dancing around." He pauses and a mischevious twinkle illuminates his blue-green eyes. "Dancing me around," he admits. One day soon, Keshvari plans to dance the tango beneath the bay tree, on a floor built from a mosaic of tiles to create the illusion of a Persian carpet. "I hope all my neighbors come and dance and celebrate, so we create harmony. I hope I get a chance to offer my heart to everyone. I love my neighbors. They've been very motivating for my growth." In the meantime, Keshvari is busy installing planters full of bamboo around the site and a statue of the Chinese goddess Quan Yin, who embodies healing and compassion in Asian culture. "The presense of her statue is the remembrance of feminine love," says Keshvari, who is also working on a statue of Venus the goddess of love, which he modeled after a friend, Jessica, "because Jessica is a very beautiful person. And then we'll have water in the pond, giant stones to form a Japanese-style path, and lots of lights all over the place." As for what he'll do with all his creative energy once his home improvement projects are completed, Keshvari, who already has a contract to help a friend convert a house and garden into a home, says he'll let God make his choices. "I'm content to do what comes, but for sure I'll enhance my artistic skills. Artists see individually. They see an aspect in, for example, a tree, that no one else has seen, and then use their technique to present that tree so people can feel and see the tree from their point of view. Art is multidimensional, vast and everywhere. Art means beauty. Art means harmony."